Gustavus PFAS Well Sample Area – August 2018. (JUNEAU, Alaska) –The Alaska Department of Transportation and Public Facilities (DOT&PF) was recently alerted to concentrations of Per- and Polyfluoroalkyl Substances (PFAS) in two wells at and near the Gustavus Airport. The PFAS discovered in an airport terminal well are in concentrations higher than Alaska Department of Environmental Conservation (DEC) action levels. Concentrations at a nearby well are lower than DEC action levels. DOT&PF is working with an environmental consulting firm, Shannon & Wilson, Inc., and DEC to identify and sample private water wells south of the airport beginning Monday, Aug. 27, 2018. “The safety of Gustavus residents is paramount. As soon as PFAS were discovered, DOT&PF initiated the process of notifying the community and testing neighboring properties. We will share test results with residents as soon they become available,” said Marc Luiken, DOT&PF Commissioner. PFAS are commonly used in products for fire suppression, resistance to wear, and repelling oil, stains, grease, and water. PFAS can be found in carpets, upholstery, apparel, paper, non-stick cookware, food packaging, personal care products, and in firefighting aqueous film forming foams (AFFF). 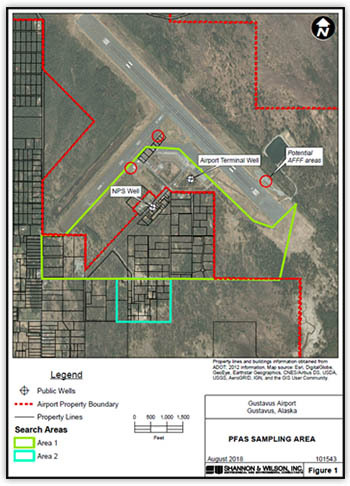 The use of AFFF during firefighting equipment testing at the Gustavus Airport is the presumed source of PFAS contamination in the affected wells. PFAS are considered emerging contaminants and the health effects are not yet well characterized. Further well testing will start next week. Residents in sampling areas can contact Shannon & Wilson, Inc. at 479-0600 to schedule a testing appointment. A graphic of the sampling area is below.